WINTER SPECIAL THROUGH DECEMBER 22! BOOK NOW! 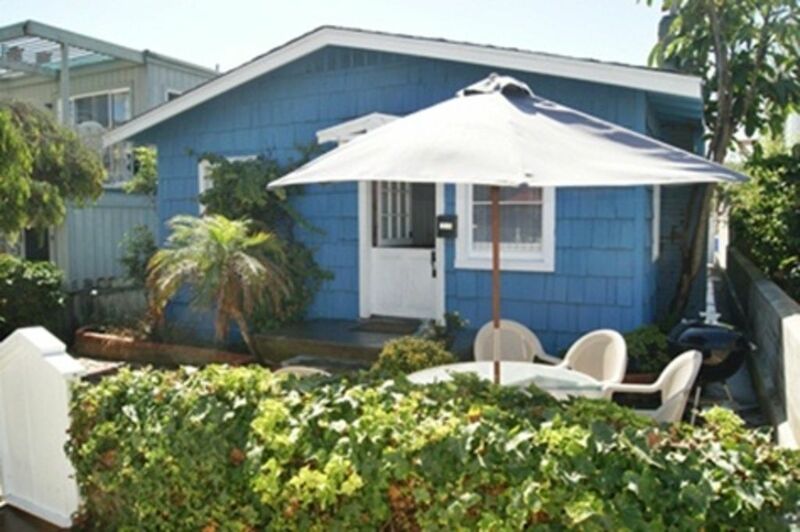 The former home of a writer and educator, this 1920's bungalow has been completely restored to provide a very comfortable stay at America's finest beach. Just steps from the boardwalk and beach (three houses from the boardwalk) and near Belmont Park and the Roller Coaster, the house comes equipped with all you will need for the perfect vacation. Boogie board,kayak, beach chairs, sand toys, garage parking and an extra outdoor shower. The master bedroom has a queen bed and flat screen TV. The second bedroom has bunk beds with a single and double. The comfortable futon in the living room makes into a double, where there is another flat screen TV and IPod/CD music player. We also have a Pack N Play for your toddler. The shelves are lined with over 300 quality books of all varieties. I keep the prices very affordable compared to any other stand alone house in Mission Beach, so it books out very well. Many people really like this historic-style cottage feel rather than 'all-the-same' condos that line much of the beach, and for good reason. The hard-wood floors and Dutch-door in the front provide a nostalgic step back in time, while enjoying the upgrades to the cottage over the years. World famous Sea World is five minutes away and the San Diego Zoo is ten minutes. World class dining can be enjoyed in downtown's Gaslamp Quarter, a ten minute drive. Mission Beach offers nightly sunsets, biking, sailing, rollerblading, surfing, boating, a roller coaster and the country's most entertaining people-watching. Book now, for the vacation you deserve. I first moved to San Diego to go to San Diego State University and landed in Mission Beach, thinking 'why would I ever want to leave here'. My wife and I lived in the house for many years and we will always keep it as it is instead of building condos on the property. We will return to the house at some point, but for now we enjoy having others enjoy the beach life. One thing that attracted me to buy this house is its location so close to the beach and boardwalk. And it is a single family home with no attached homes, on its own lot. We also loved the historic value in an era when so many others are building new condos. Having a single-family house on its own lot is a huge benefit. There are no common walls and you aren't sharing the yard with anyone. The proximity to the boardwalk and sand is a big plus, too, for a fraction of the price of the oceanfront properties which have very little privacy. Cute cottage. Able to see the beach and listen to the waves as you sit out on the patio. House is dated, but you have everything you would need. Queen bed was very uncomfortable and the pillows were paper thin. With some new pillows, I'd stay again. Great location. Everything we needed to enjoy our time in San Diego. The beach is easily accessible and the beach toys were put to good use. Kitchen was well equipped. Parking was tight but we did fit a mid-sized SUV in the garage. Hope to make it back again sooner than later. I'm glad you enjoyed your time, Dolan. I hope you can come again! You cannot beat this location or price! Cute little house! We had such a great vacation here. Steps from the beach you can see/ hear the ocean from the patio. My only suggestion would be to get a more comfortable mattress for the master. But we had a great experience here! Fun little house. Was perfect for our needs! I had to cancel duty to an illness. The owner was very compassionate and aboleasure to work with. I will definitely be re-booking this in the future. Thanks so much, Brian. I hope your daughter is recovering and you can make it another time. We so enjoyed staying in the cottage! Everything was so convenient! The ability to do laundry was amazing. Also, being so close to the ocean was the best! Thank you!!! 5 minutes to Sea World, ten minutes to San Diego Zoo, ten minutes Downtown Gaslamp Quarter, 10 minutes to La Jolla, 5 minutes to many bars and restaurants.